From I-40 east take the Canute exit right, turn right go to the first road Old route 66 turn left about a mile. 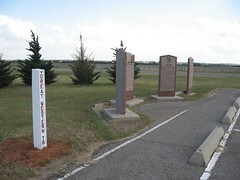 Markers and Cemetery are on the left side of the road. 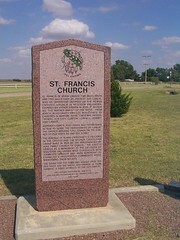 St. Francis of Assisi Church two miles south and two miles eas of present day Canute was and important outpost of the Roman Catholic Church in Western Oklahoma. Founded by Father Steber in 1899. It served as " The Mother Parish of the West" from which missionary priests ministered to churches in Mangum, Sayre, Cheyenn, Anthon, Thomas, Elk City, Clinton, Cordell, Hobart and Canute. Another church Holy Family was established in 1926 to serve the parishioners of Canute. The church building still stands on the corner of old Route 66 and 9th street. 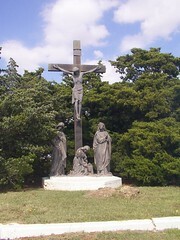 The Heritage of Plains Christianity is embodied in the Grotto and the Bronze Crucifixion group built in 1928 by the parishioners of Holy Family Church of Canute. The Grotto serves as a monument to the settlers of Western Oklahoma and struggled with tornados, drought and "Blue Northers" to establish a prosperous community while maintaining their beliefs. The stone for the tomb was hauled from the Red River and the Native Red Granite is from Granite a town 40 miles to the south west. 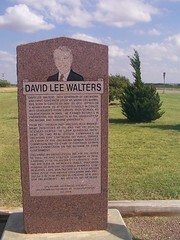 David Lee Walters, 24th Governor of Oklahoma and first Governor from Western Oklahoma, was born in Canute on Nov. 20. 1951. Raised on a nearby farm. He attended schools in Canute and graduated from Canute High School as Valedictorian in 1969. He earned degrees in Engineering and Business at the University of Oklahoma and Harvard University. From 1977 throught 1982 Walters held management positions at OU and the OU Health Sciences Center. He later served as President of two Real-estate Companies in Oklahoma City. Continuing his public service as Chair of the Oklahoma Human Services Commission and Co-chair of Governor George Nigh's Commission on the reform of State Government. Following as unsuccessful bid for the Office in 1986. He was elected Governor in 1990 carrying 75 of Oklahoma's 77 counties. During his term he increased public education funding 30 percent, reformed workers compensation laws, won passage of $350 million bond issue for higher Education and produced a 10-year record in creating new jobs for Oklahomans. All with no tax increase. Early inhabitants of the area were plains indians who followed and hunted the roaming herds of buffalo that grazed the rich grasslands of this area. evidence of several Indian encampments have been licated on Trail,Elk,Turkey and Oak Creeks as well as Indian Springs. Spaniards, Mexicans and Americans searched for Gold in the canute area. Somewhere along Turkey Creek may have once trived the Fabled Meican Gold mining town of Cascorillo. The wealth they sought in vain was found by later residents in the form of wheat, cattle, oil and natural gas. Texas cattle moved through the area after the Civil War to the railhead and markets in Kansas. 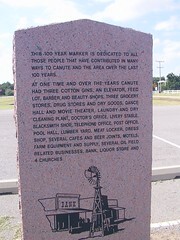 The Great Western Trail crossed present day I-40 approzimately one and one half miles east of present day Canute. Farmers and ranchers arrived in the Land Run of 1892 with the opening of the Cheyenne-Arapaho Territory. 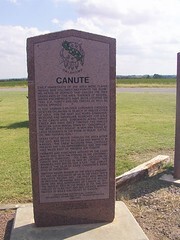 The final location of Canute was settled in 1902 by lottery. The winner paid $10.00 for a lot. The Canute Bank is the oldest state chartered bank still in operation. Another major source of the area's prosperity was the discovery fo oil in the early 1900"s and later natural gas. The first well drilled in Western Oklahoma was on the C. H. Wilcox farm one mile northeast of Canute in 1917 the deepest well in the world at the time was drilled to 31441 feet and was located approsimately 10 miles southeast of Canute. 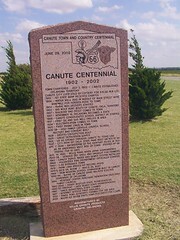 This 100 year marker is dedicated to all those people that have contributed in many ways to Canute and the area over the last 100 years. At one time and over the years Canute had three cotton gins, and elevator, feed lot, barber and beauty shops, three grocery stores, drug stores and dry goods, dance hall and movie theater,laundry and dry cleaning plant, doctor's office, livery stable, blacksmith shop, telephone office, post office, pool hall, lumber yard, meat locker, dress shop, several cafes and beer joints, motels, farm equipment and supply, several oil field related businesses, bank, liquor store and 4 churches. 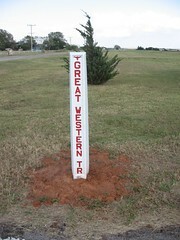 Great Western Trail Marker was place with other markers in 2007.